Discussion in 'Portable Headphone Amps' started by kunlun, Oct 16, 2012. I just got mine and I'll update this post as people start getting theirs and put up reviews and comments. From talking to Todd, the dac is a big step up from the old one in the Slim. While the amp is basically the same, it should sound a bit better as the power supply is upgraded. It's slimmer than the Slim was, too! 24-bit, 96-kBPS USB DAC – A Cirrus Logic DAC driven by a Tenor isochronous USB interface provides support for up to 24-bit, 96-kSPS digital audio from a USB host. This implementation requires no drivers, and works seamlessly with Windows or Mac PCs or other devices with a USB host port (including the iPad using the Apple CCK). 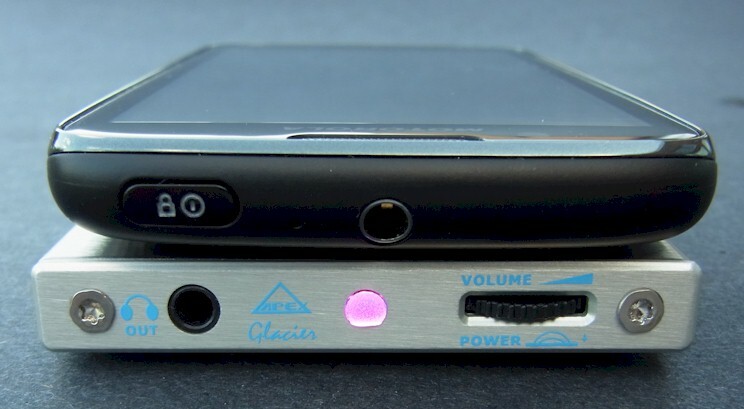 Charging from the USB DAC port can be enabled or disabled, to allow use with low-power portable devices that cannot supply enough current to charge the Glacier. Stepped Attenuator - No cheap volume control pot here. Small potentiometers are notoriously bad - they mis-track, get noisy, and break. So the Glacier uses a microprocessor-controlled analog stepped attenuator. Each of the 32 steps changes the volume level by a precise 2dB, and the gain difference between channels is less than ±0.2dB - compare that to normal pots that at best provide ±3dB! The current volume setting is indicated by the color of the front-panel LED. In addition, you can select 0dB, 10dB, or 20dB of maximum gain at the press of a button, to accommodate all sources and headphone sensitivities. High output power - What's the point of a headphone amp if it can't drive any more than your iPod? Using a current feedback amplifier, the Glacier puts out 2.6V RMS (7.4V P-P) and up to 100mA of output current, so can easily drive nearly any headphones. The highly efficient, high frequency regulated power supply guarantees full output power over the life of the battery, with low noise and high output current for powerful bass response, even with low impedance headphones. DC-coupled design - The signal path in most portable amps is AC-coupled, with a single power supply. This requires the audio signal to pass through multiple capacitors, which degrade the sound and limit frequency response. The Apex Glacier has a bipolar power supply, allowing the audio path to be DC-coupled. That means the low-frequency response extends to 0Hz! Long-lasting, rechargeable battery - The Glacier contains a lithium-polymer battery which will power the amp for 12-15 hours at typical listening levels. It recharges in about 2 hours from any USB port, or a USB wall charger. You can also operate it while plugged in to keep the battery topped off. Slim, stainless-steel case – A full metal enclosure with stainless-steel skins makes the Glacier slim, strong, and resistant to EMI (electromagnetic interference). Sized to match common portable devices, the Glacier is the thinnest portable headphone amp made! Reserved, maybe I'll link to reviews here! Reserved....As I also might get one. should get mine next week! Also looking forward to the Kunlun review! devs to write firmware so they can do it. Tested and working with the Galaxy S3, whose USB audio behaviour seems identical to the Note 2. Should be a go. Might pick one up if the reviews are favorable. This seems to me like a JDS Labs C421 with a Dac, I wonder how they compare. I originally tried to buy the ttvj slim, as i read on headfonia's portable amp shootout that it has better treble apparently than the headstage arrow. Hopefully it pairs well with my ety er4s! Other cans: Senn PX100, AT EW9, AKG K501 Litz Cable Mod II "SuperBASS"
So, apparently, I got the very first Glacier. Coming from a few weeks with just an ipod, I find the Glacier amazing, but maybe that's not saying much! It's better than I remember my TTVJ being. I'm going to try it out with a few different custom iems. Just got mine. Now to find an adapter to try the DAC with my iPhone 5. Wish me luck!